Taking care of the modern equine athlete, especially with the physical and mental stresses that the performance arena can demand, can be a truly comprehensive program. Our goal at Cody Veterinary Hospital is to provide a wide range of services to help the performance horse continue to succeed in both their training and competitive programs. We provide medical diagnostics in order to effectively diagnose and treat common performance-related disease such as gastric ulcer and respiratory disease. These diagnostic procedures include, but are not limited to: digital radiography, in-house laboratory work, ultrasound, and endoscopy. 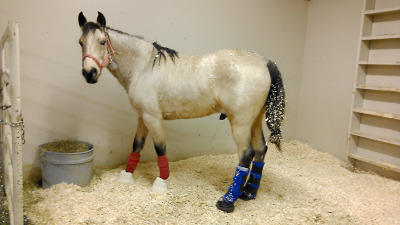 Complete lameness evaluation and pre-purchase examinations are performed regularly as well. Referral and case review services are also an option for the more complex cases, as Dr. Moore has worked closely with lameness/surgical experts in multiple places in the country, including: Washington State University and Montana. We also provide an on-site farrier who works closely with our veterinarian to provide high quality corrective shoeing, a treatment oftentimes necessary in lameness cases. Our number one priority at Cody Veterinary Hospital is the longevity of your performance horse’s health. We believe in comprehensive care and collaborative treatment in order to create the best circumstances under which each horse can succeed. My sister relied upon them to care for all of her animals, and so do I. They have a caring staff that is thorough and knowledgeable. I highly recommend the Cody Vet Hospital for ALL your animal needs... large and small.